It's time to show you one of the new High Hopes Rubber Stamps images. Isn't that girl just too cute?? And I love the sentiment that goes along with her. 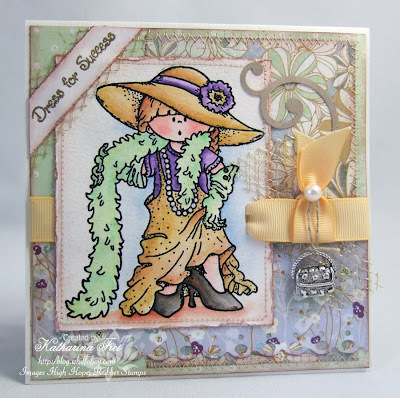 The talented Ying challenges us to use "Heat embossing" for this weeks High Hopes challenge. So I used black fine line embossing powder to emboss my main High Hopes image and golden embossing powder to emboss the sentiment. What a fun experience to emboss the image. It gives solid and clear lines and helps to stay in the lines during colouring. Es ist an der Zeit euch ein weiteres der neuen High Hopes Rubber Stamps Motive zu zeigen. Ist das kleine Mädchen nicht zu putzig? Und ich liebe die passenden Texte, die es immer mit den Stempeln gibt. Die talentierte Ying setze die Challenge dieser Woche auf dem High Hopes blog "Heiß Embossing". Ich habe schwarzes Feinlinien Embossingpulver verwendet und damit das Motiv selbst embosst. Ausserdem ist der Text mit goldenem Embossingpulver behandelt. Es ist eine ziemlich neue Erfahrung das Hauptmotiv vor der Coloration zu embossen. Es gibt schöne, kräftige Linien und man kann nicht so leicht hinausmalen. I received the little charm purse from my friend Rach again. Ohh, she has the most wonderful and special charms...haha Thanks Rach! Das Handtaschen Charm habe ich von meiner Freundin Rach bekommen. Sie hat wirklich die einzigartigsten Charms...haha Danke Rach! 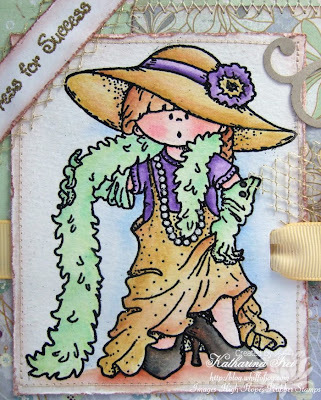 Thanks for stopping by and don't forget that the chance to pre-order the Whiff of Joy / Elisabeth Bell Summer Stamp Kit ends today 0:00 pm my time (there is a clock on the left sidebar). Danke fürs Vorbeischaun und vergeßt nicht, dass heute die Möglichkeit der Vorbestellung des Whiff of Joy / Elisabeth Bell Summer Stamp Kit endet und zwar um 24:00. An adorable image - the shading you have achieved is so good and I love the way you have attached that gorgeous charm. Eine wunderschönes Motiv und eine traumhafte Karte!! Oh this is so super sweet I love it! So adorable,I love the colours and your beautiful charm!!! Love the little handbag charm, it fits this image perfectly! Fantastic card! That image is so funny and I love how you did your ribbon. The metal handbag charm is gorgeous. What a sweet card Katharina, very nice paper and colors. oooo i just LOVE this card!! Die Lady is einfach zu süß!!!! Und deine Coloration ist wieder ein Traum, genauso wie die ganzen lieben Details an deiner Karte!!! Katharina, your color choices and coloring skills are just over the top fantastic! This is so gorgeous, I love it so much! I esp. love the unique way you embellished the ribbon! Gorgeous, wow! Fabulous Katharina!! 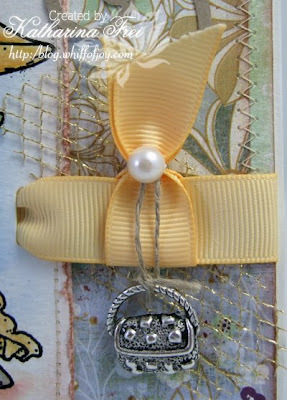 Love the ribbon detail and the purse charm, too cute!! Very sweet card! Love your choice of colours and your colouring is awesome. Nice touch with the charm!